As West ham's grip on star defender Winston Reid increasingly loosens, many Hammers have started to accept that the Kiwi seems Arsenal-bound. For his part, Big Sam has done his best to muddy the water by alleging untoward familiarity between would be wooers and his current star, but even this seems desperate. A different perspective is that this may be a crafty attempt to soften our North London neighbours attitudes ahead of the inevitable negotiations to part with their right back star when his season-long loan comes to an end. Jenkinson has warmed to life in the East end with a series of stunning performances this season, with today's efforts against Swansea amongst the very best. In simple terms, Jenkinson has been a quiet sensation- solid defensively (what about that tackle in the first half when a goal seemed certain? ), while offering a whole added dimension to our offensive efforts. It is no coincidence that this season we are the highest ranking team in the Premiership for crosses into the box with Aaron Cresswell and Jenkinson a constant source of intelligent supply. So as the January window continues, this may indeed be the time to do some business in respect of Reid while we still have some say on what happens next? Losing Reid would be tough - but capturing Jenks on a long term contract would certainly soften the disappointment, which seems almost inevitable at this stage. For Arsenal, if they let matters run until Reid is out of contract then there will likely be a stampede to sign a proven and high performing Premiership centre back. For both club it seems that now is the moment to do business. 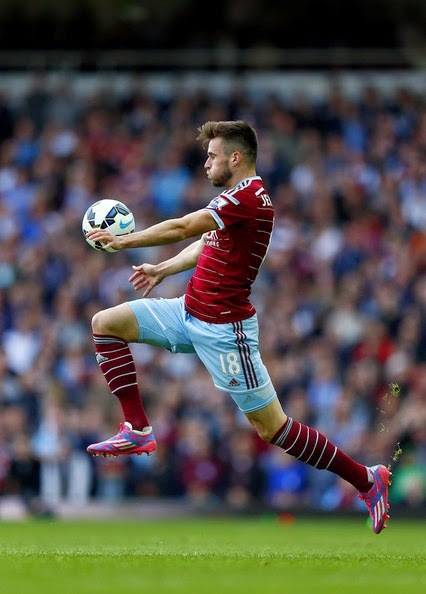 As a gooner I'd rather keep Jenkinson for the future and get another CB. Sending him on loan to a proper coach who knows how to organise a defence was a master stroke from Wenger. I'd think Chambers could also benefit from a similar switch. And also, I would prefer to convert Debuchery to CB rather than buy Reid. Just imagine if we never loaned him out, Chambers wouldn't of had to play RB and letting Monreal play CB. Would like it but just dont see how it can happen. In Reids position it makes little sense to move this window & miss out on the big signing bonus or increased wages that come with being a free agent. I would guess Jenkinson with four years on his deal is also alot more valuable. oops! They already did...lets hammer down agreements for all three as we take over Europe from the OS! This board allow us to dream. I think Jenks is awesome, (I am a gunner), I think he needs to do what is right for his career, like Podolski, who is also awesome, being awesome does not mean game time under Wenger. It would be a massive shame to lose him, but he is not bench material, neither was Podolski, both have massive hearts and massive talents and great personalities and will be huge at any club that plays them regularly. I would dearly love to see him get the RB spot at Arsenal, I could not give a toss about Reid, but Jenks needs to play to get that England berth, and I would not begrudge him blowing bubbles. Wish u were Arsenal manager! For me if Reid doesn't want to sign for the Mighty Hammers then he should go asap..To anyone who wants to pay him 70 grand plus a week ....As for Jenks..Sign him up ..offer Wenger any thing he wants....How about a box at the OS so he can watch the hammers in the Champions League ? Looks like all that preseason stuff in NZ was a waste of time.